When it comes to functional footwear staples, we always keep an eye out for chic booties. A great way to complement our chilly weather wardrobe, this design always makes a stylish statement with Kristin Cavallari boots! We love boot styles with a dose of fashion but have secret powers to elongate our legs, too. So naturally, once we spied these effortlessly stylish Kristin Cavallari boots marked down, we immediately had to swoon. See It: Grab the Kristin Cavallari Bootie at Nordstrom for up to 55 percent off the original price of $170, starting at $75 in ash suede, black suede and clay suede while still in stock. Not your style? Check out other Kristin Cavallari boots in all styles on sale now! 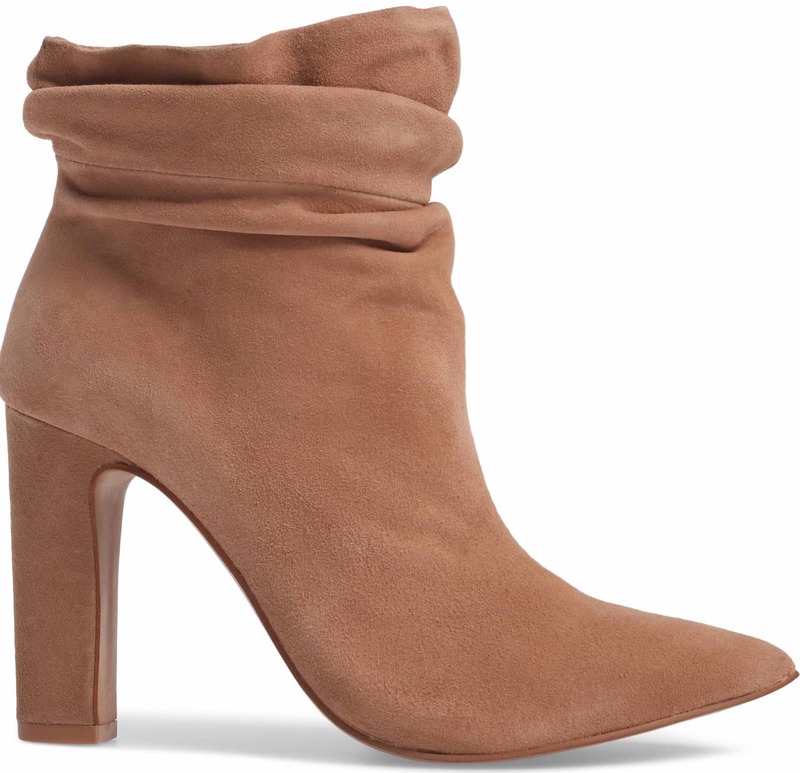 The Kristin Cavallari Kane Bootie is a fabulous design that will look great with our casual and dressy outfits and will certainly earn extra wear miles with our year-round style. Boasting a dramatic pointy-toe heel and slouchy silhouette, the tall block heel comes in at just over three inches to give our legs a miles long effect we love. What we love most about this construction is that we can strut our stuff without having to worry about sore feet with every wear. We are totally smitten with the black suede offering. A classic staple that will mix and match with our everyday wardrobe perfectly, the sky is the limit for stepping out with a chic ensemble. We live for a functional neutral and this style falls right in line. The ash suede style is also a great choice for those who want to veer away from the classic hue. Equally functional and trendy as the black offering, this number is a great way to give our go-to bootie a stylish break. For fashionistas who can’t get enough of an earthy hue, theKristin Cavallari boots in clay suede option is just what you need. Flaunting a gorgeous tan brown shade, this number is a great way to add a light accent into our winter-ready style. We love a great deal and since these Kristin Cavallari boots normally retail for $170, we are excited to see a jaw-dropping markdown. Depending on the color and size choice, these shoes are marked down up to 55 percent off and start at $75! There are a variety of ways we can style these booties and we plan on pulling out a midi leather skirt, a fitted graphic sweater, a buttondown top, a top coat, satchel and infinity scarf for our next casual Friday at work. Thinking of a date night look? We can slip on a figure-hugging bodycon dress, a moto leather jacket, large hoop earrings, a cross-body bag and a bold red lip. For days when we’re running errands, we can team this style with boyfriend jeans, a long sleeve tee, a wrap coat and a tote bag for stylish comfort. Athleisure style on the brain? We’re thinking of slipping on striped leggings, an oversized sweater, a midicoat and a backpack to seal the deal. Whether your style changes with the day or you keep it simple and refined, this design will come right in handy. Nordstrom shoppers are equally impressed. Many reviewers love that the heel is quite high and surprisingly comfortable, while others love that there is arch support. Shoppers also dig that the suede is very rich looking and soft, while others like that the slouched detail around the ankle sets this style apart from the others. With sizes flying off the shelves, now is the time to bring this design home with Us. You can’t beat a trend-savvy style that looks good with virtually any outfit we can dream up and these booties are no exception. Give your footwear collection the update it needs and scoop up these Kristin Cavallari boots while still in stock. See It: Grab the Kristin Cavallari Kane Bootie at Nordstrom for up to 55 percent off the original price of $170, starting at $75 in ash suede, black suede and clay suede while still in stock. Not your style? Check out other Kristin Cavallari boot styles on sale now!